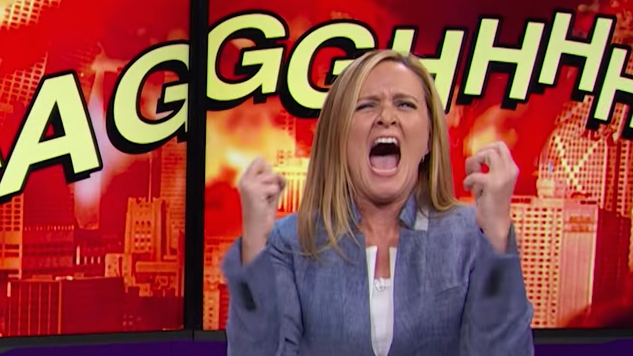 Last week, Samantha Bee pretty much convinced me that Donald Trump can’t read. Bee is funny. She’s passionate. She is not as constrained as network late night hosts and she is not afraid to be smart or angry. Whereas John Oliver provides background on underreported issues, Samantha Bee educates us on top news stories that have been misrepresented and misinterpreted, which we sorely need. She is not afraid of local politics, feminism or unpopular stances. While many shows pay lip service to diversity, her writing staff is a shining example of it. And currently, they’re the funniest in late night. Perhaps it is Bee’s experience that gives her an edge on other shows. She was the longest running correspondent on The Daily Show before taking on a show of her own. Full Frontal immediately had a unique tone, point of view and the best format to get those across. Bee immediately knew whom she wanted to bring along—for example, Allana Harkin and Jo Miller—and, with her team, made bold, wise choices to stand out from their peers. They knew they had to forego a desk in order to serve Bee’s passionate language. They knew a weekly show meant more time to write the best jokes and create the best field pieces. They knew they didn’t have to adhere to the Daily Show format for field pieces either. And they knew they’d be different from John Oliver’s weekly show without trying to be, because that’s what happens when you understand your comedic voice so well. Bee is also not afraid to go dark, something we sorely need when discussing certain topics. When this segment, on workplace sexual harassment, aired, I cheered. She took all the darkness of dealing with predators and instead of lightening it up with jokes, she used them to punch even harder. When Jimmy Fallon tousled Donald Trump’s hair, Bee was there to set him straight. You don’t get to be cheery when the nation’s in danger and expect to endear yourself to people. Bee and her staffers endear themselves with the level of raw honesty her audience has been craving. And she doesn’t have to go sincere just because the subject matter is dark or sad (though she can!) It’s important to note that Bee is less restricted than many late night hosts because she is on TBS. She takes that freedom and runs with it. Bee has also taken the torch from Jon Stewart when it comes to skewering the media. We need Full Frontal because she fact-checks when media outlets refuse to do so. When Bee held a megaphone to her face to say, “PARTIAL BIRTH ABORTION’S NOT A THING,” that was the first time many of her viewers learned this. In fact, she’s the reason many of us know where the pro-life movement came from in the first place. Where John Oliver usually gives us background on topics that go under reported, Bee gives us background on news stories the media has been misreporting all day. Bee also contends with hate like a champ. She provides a shining example of how to survive in the age of anonymous comments and trolls. Her YouTube series “Internet Comments: Real or Fake?” provides an inside look into what women have experienced on the Internet for years. Full Frontal is a master class in “killing them with kindness.” This episode shows her addressing the Bernie Bro viewers whose contentions she wasn’t afraid to skewer with grace and dignity. Somehow, Bee and her staff manage to embody class and maturity and still call themselves Full Cuntal. There she stands, strong and majestic, ahead of the late night pack. She has since embodied this image. There simply isn’t anything like her out there.